North East Stars celebrated last week’s triumph over Digicel Pro League leader Defence Force with an even more impressive 3-1 victory over second placed Neal & Massy Caledonia AIA at the Ato Boldon Stadium in Couva yesterday evening. 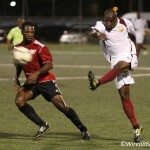 The Stars win, coupled with a 2-2 draw between DIRECTV W Connection and Central FC, propelled the Sangre Grande-based team to third in the Pro League standings and five points behind Caledonia. 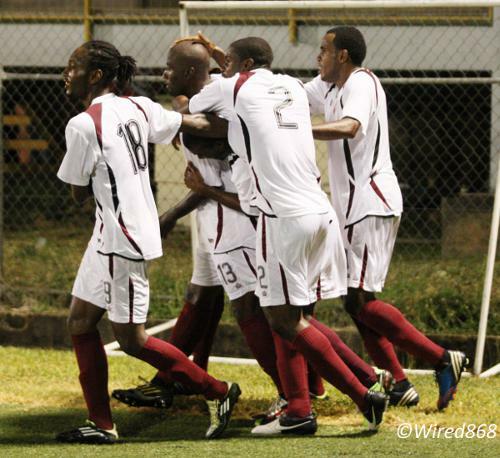 Photo: North East Stars striker Cornell Glen (centre) is mobbed by teammates after a goal in a previous fixture. 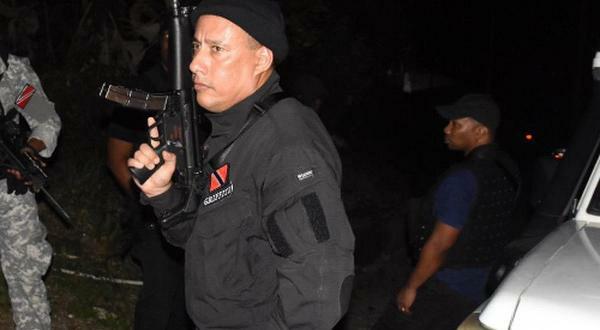 The Morvant/Laventille-based “Eastern Stallions” had hoped to trim Defence Force’s lead to just a solitary point but, instead, now trail the frontrunner by four points. Connection, the defending Pro League champion, is now 10 points behind Defence Force with only five league games remaining and has surely now resigned itself to relinquish the title. 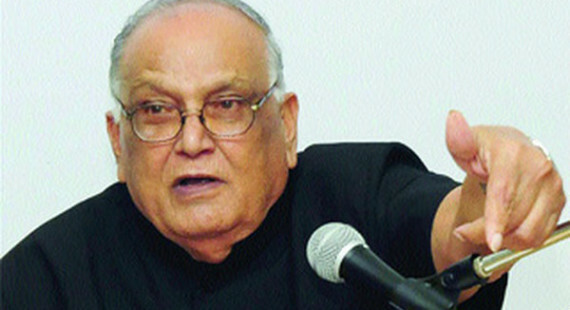 Club owner David John Williams had a variety of reasons to be displeased yesterday as Connection dropped two points against Couva rivals, Central FC, who was led by an old rival and former San Juan Jabloteh coach Terry Fenwick. But, even worse, Central benefitted from a goal that surely should not have stood. 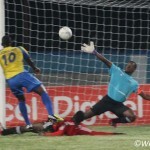 Veteran St Lucian defender Elijah Joseph, who turns 39-years-old this September, got his angles wrong with a back pass in the 30th minute and had his goalkeeper Alejandro Figueroa scampering towards his goalline to attempt a clearance. Figueroa lunged towards the ball and appeared to hook it away before it crossed the line. Referee’s assistant Caleb Wales stood motionless, which suggests that the Colombian custodian was successful. But match referee Joel Davidson, who was further away from the action, incensed the Connection team by signalling for a goal. 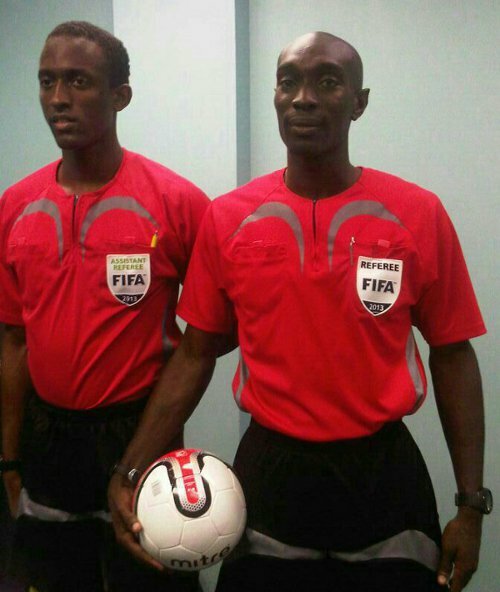 Photo: Referee Joel Davidson (right) and referee’s assistant Caleb Wales might have gotten their wires crossed yesterday. The goal nullified Connection’s opener, which came via an Andrei Pacheco finish in the third minute after a low cross from Surinamese forward Stefano Rijssel found the utility player unmarked in the opposing penalty area. And yet, within three minutes of Connection’s protest at the Central equaliser, the “Savonetta Boys” were ahead again as the in-form Joevin Jones ran on to an Akeem Thomas cross and neatly flicked the bouncing ball over Central goalkeeper and captain Marvin Phillip. It was Jones’ eighth league goal of the season and 11th in all competitions and took him past another Connection starlet, Shahdon Winchester, who joined Finnish Premiership team FF Jaro in the January transfer window. 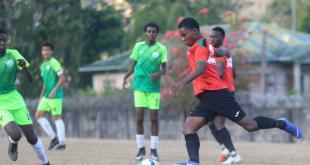 But the “Couva Sharks” were not done yet as Central got a second equaliser in first half stoppage time. Winger Jason Marcano, a surprise omission from the Trinidad and Tobago national team to face Belize and Peru, whipped in a superb cross from the right flank and striker Peter Byers rose to head home his third goal from Central’s last two matches. Photo: Central FC winger Jason Marcano (second from right) swings a cross towards teammates Peter Byers (number 14) and Marvin Oliver. Neither team could deliver the knockout punch in the second half although Connection came closest. 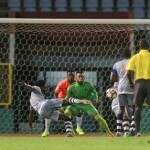 Somehow, Phillip contorted himself in mid-air to palm away a Rijssel header in the 81st minute and, despite his heroics, he still needed defender Keion Goodridge to be alert to stop Connection substitute Jomal Williams from converting the rebound. 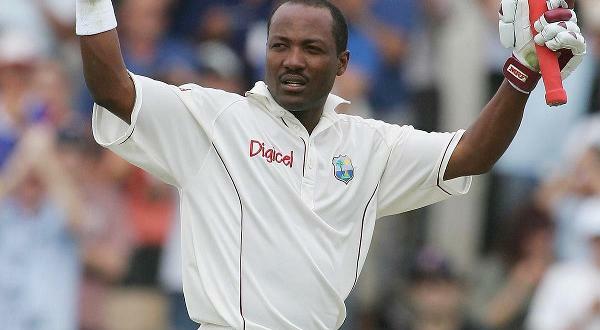 In the opening game of the Couva double header, a comfortable start again proved misleading for the contest. 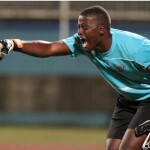 A debatable hand ball decision saw Kareem Joseph put Caledonia ahead in the 12th minute with his fifth successful penalty kick and seventh goal of the Pro League season, which is five goals more than the two scored by the League’s second most prolific defender, Police’s Elijah Belgrave. A deflected Densill Theobald free kick rapped the upright in the 18th minute while Keyon Edwards dragged his shot wide at the far post after a promising Caledonia move in the 26th minute. The momentum shifted dramatically in the second half. 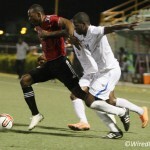 Caledonia coach Jerry Moe replaced Argentine midfielder Miguel Romeo with striker Sheldon Holder during the interval. A combative midfielder who distributes efficiently, Romeo has done well at central midfielder but is less effective on the flank where he has ended up after Theobald’s return. Still, Moe might have gambled by replacing him on the right flank with such an attack-minded player as Holder. And two of Stars’ three goals started on Caledonia’s right wing. It did not help either that Caledonia left winger Nathan Lewis was anonymous and Theobald seemed to run out of gas. The first Stars item was generously awarded to striker Cornell Glen in the 54th minute as his speculative shot struck the post and hit Caledonia custodian Shemel Louision in the back of the head before rolling over the goalline. 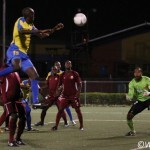 Glen doubled Stars’ advantage in the 66th minute from the penalty spot after Caledonia striker Trevin Caesar clumsily barged over substitute Kerry Baptiste. Baptiste was influential in their third goal as well as he diverted a left side cross off the far post and another substitute, Gary Glasgow, slammed in the rebound. It was the second Stars triumph in three Pro League meetings against Caledonia this season. There is no more room for slip ups from the Stallions. North East Stars (4-2-3-1): 22.Cleon John (captain); 23.Kennedy Hinkson, 2.Kareem Moses, 11.Elton John, 5.Kevon Villaroel (6.Jeromie Williams 62); 25.Keryn Navarro, 17.Jayson Joseph; 10.Marcus Gomez, 24.Keithy Simpson,7.Elijah Manners (4.Kerry Baptiste 58); 13.Cornell Glen (12.Gary Glasgow 76). Unused substitutes: 1.Adrian Foncette, 9.Akiel Guevara, 16.Jean-Luc Rochford, 18.Kaashif Thomas. Caledonia AIA (4-4-2): 1.Shemel Louision; 12.Kareem Joseph, 3.Nuru Muhammad, 5.Aquil Selby, 2.Aubrey David; 22.Miguel Romeo (28.Sheldon Holder 46), 7.Stephan David (captain), 21.Densill Theobald (26.Vurlon Mills 79), 27.Nathan Lewis (23.Jamal Gay 79); 9.Keyon Edwards, 6.Trevin Caesar. Unused substitutes: 34.Kevin Dodds, 4.Colin Nelson, 16.Odelle Armstrong, 20.Akeem Thomas.